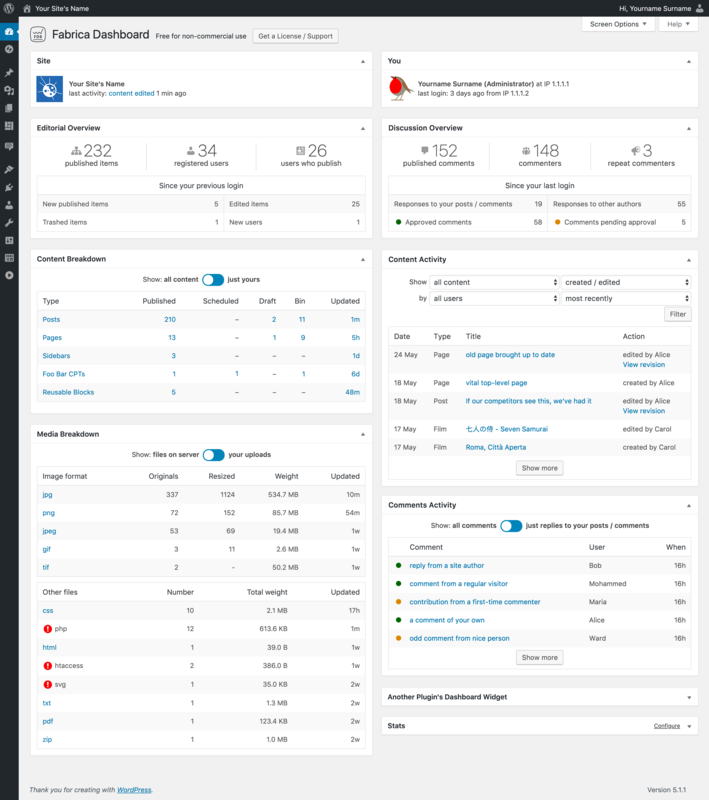 At last, a better WordPress Dashboard. Our plugin gives you a more powerful and useful overview of all your content and activity, to help you keep your site up to date and under control. What's changed since my last login? Top-line counts of publications and users help you to keep track of your site’s growth from one login to the next. If you co-write with other people, or have editorial/administrative responsibility for a team, Fabrica Dashboard helps you keep up to date with what everyone else is working on. What makes up my site? Posts, pages and custom content types. 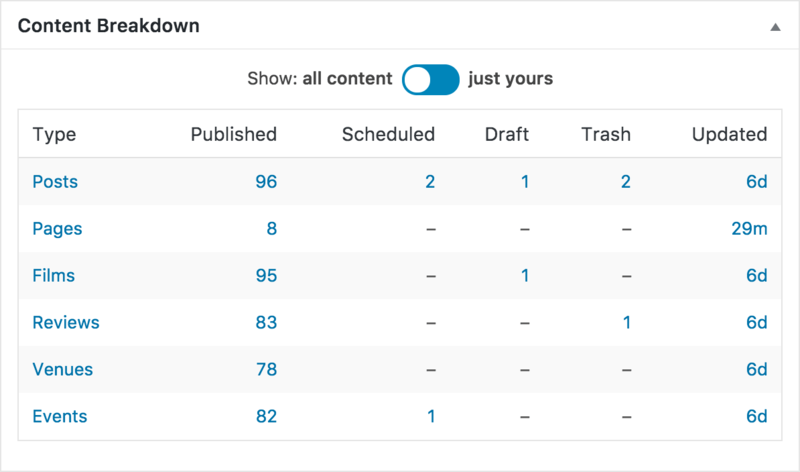 See what your site is made of, what’s scheduled, what’s still in draft, and what has been trashed. Quickly spot what needs your attention. Toggle to focus on your own content. Catch up on all the recent editorial activity on your site, across all content types. 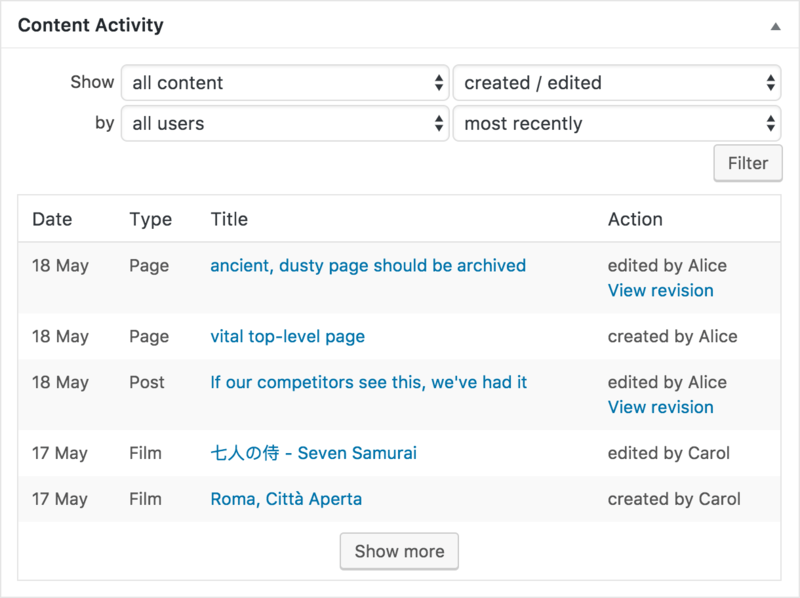 Filter activity by post type, user or time period, and distinguish edits of existing content from new additions. Check changes with a direct link to the post’s Compare Revisions screen. What's in your uploads folder? 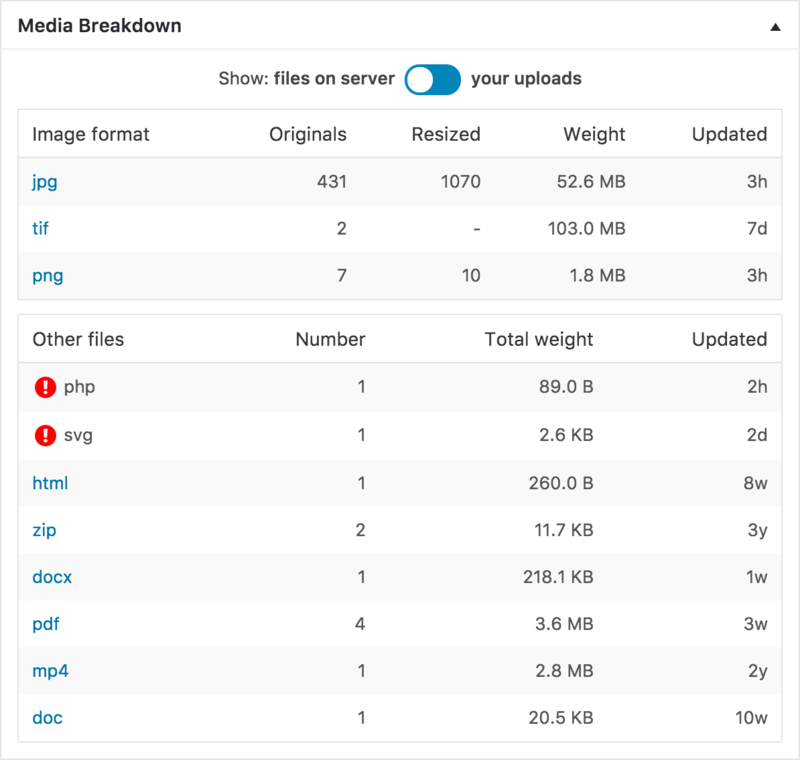 Keep server space in check, spot outdated, unwanted and malicious file formats, and get early warning of any security issues with flags for any file formats not allowed by your WordPress configuration. Toggle to only see your own uploads, linked through to the Media browser so you can find specific files more easily. Are comment numbers growing? What's happened since your last log-in? A top-line count of comments, commenters and repeat commenters, so you can gauge whether discussion on your site is growing healthily, and see what actions you need to take to stay up to date with your audience. Who has commented? Which comments need your attention? 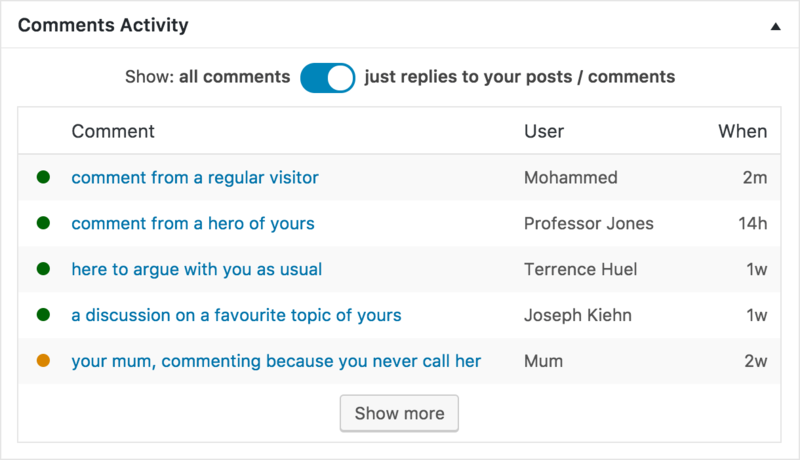 Toggle to see only replies to your own posts and comments, so you can keep your visitors engaged; or keep an eye on recent comments from across the whole site in the approval/spam queues. A quick reminder which site you’re working on, and a note about the most recent activity. Make sure you’re logged in with the right account, and check no unauthorised use has been made of your login details. We follow WordPress’ philosophy of providing ‘decisions, not options’, so the plugin doesn’t require any configuration to work with your site and content, even – in fact, especially! – Custom Post Types. All the new boxes respect and reflect your site’s user role permissions and content access settings. Our plugin also follows your site’s relevant configuration / set-up parameters (eg. when flagging disallowed file formats). If you see something unusual, it might be a useful sign of how the rest of the site is configured. Fabrica Dashboard plays nicely with any other individual dashboard widgets you already use (e.g. for analytics, SEO or e-commerce). Comment-related boxes are only shown if you are using WordPress’s own comments system, otherwise it hides them automatically. It doesn’t work with external comment systems (but if they’re any good, they should have their own dashboard widget anyway, and Fabrica Dashboard will be compatible with that). We built this plugin to fit seamlessly into wp-admin using native methods, patterns and styles for compatibility with WP core, with other plugins that also follow WP best practice, and with your custom code.